The Best TENS Machine: Which is the Best Massager Unit For You? The TENS unit used to be a machine that only health professionals could get their hands on. For the public, this meant that to use a TENS machine, they could only do so by going to see a professional. The TENS machine is a machine that has been involved in helping many people relieve themselves of everyday pain in the body, and having to make an appointment to use one is of great inconvenience. Luckily for us, things are different now. The TENS machine is now available for home use. Not only that, but they have become small, portable and easy to use. And best of all, they won’t cost you an arm and a leg as they are extremely affordable. If you suffer from bouts of pain in the body or have been recommended trying a TENS unit, then this post will be of interest to you. TENS stands for Transcutaneous Electrical Nerve Stimulation, which is a form of treatment that can help ease pain and bring relief in areas of the body that ache. This is done through a TENS unit. A TENS unit is a small electrical device with up to 4-6 wires which connect to gel pads. The pads are stuck onto the body above the aching areas. Once the pads are stuck on, the TENS unit will send small electrical currents to stimulate the nerve endings to the areas of the body under the gel pads. Purposely electrocuting oneself doesn’t sound appealing, nor does it sound like it would relieve pain, however, the jolts of electricity are small enough that it is safe to use. Typically units are battery powered or charged via USB, and are not plugged straight into a mains supply. How Exactly Does a TENS Unit Work? The TENS unit will send an electrical pulse that will target the nerves and cause the muscles to contract and relax. This confuses the pain signals that are sent to the brain, and endorphins are also produced as a result. The overall effect is pain relief in the areas where the gel pads are placed. Given that TENS units have become so small and portable, many people use them whilst on the move or whilst they are working. Some units can be attached to clothing, clipped onto a belt or held in a trouser pocket. If you’ve already heard of TENS then you may have come across the idea of EMS (electrical muscle stimulation). The two are often confused. Both use electrical pulses to target areas of the body, but the difference between the two is in their names. Whilst the TENS will target nerves, EMS targets muscles. What will a TENS unit Help With? As stated above, a TENS unit is used only for pain relief and is not intended to deal with chronic pain. It may be useful for general, neck, knee and back pain. It is also commonly used for helping pain associated with arthritis and period pains. People who are recovering from injuries sustained during sports may also find a TENS unit beneficial. The TENS unit is also used as a form of pain relief during child labour. Does a TENS Unit Work? There isn’t any hard scientific evidence to suggest that using a TENS unit is a reliable form of pain-relief, however many people find them very helpful in combating pain. The effectiveness will depend on the person and in particular, what type of pain they are trying to find relief from. Either way, the TENS unit is a safe and drug-free method worth trying. Most of the TENS unit available for home use are quite similar, however, there are a few differences to look out for. Most TENS unit are battery powered. Some require one 9 volt battery and other models may require three AAA batteries. It all depends. Given the day and age we live in, some of the more ‘tech-savvy’ buyers may prefer a TENS unit that is chargeable via USB. These type of TENS unit are becoming more available, however, the battery type still tend to dominate. If you don’t want the hassle of having to spend money on buying batteries then the USB type of TENS unit will be more for you. However, some people may prefer the simplicity of using batteries. A TENS unit which is ‘dual channel’ means that it is able to send two different intensities across its electrodes. This is beneficial if you wish to work on two different parts of the body with two different intensities, or if you are feeling in a generous mood, a dual channel TENS unit can be shared them with someone else. If you want to keep your sessions with your TENS unit simple you may not need a dual channel unit. Different TENS units will come with a different number, and size of pads. This may be an important factor depending on the part of the body you plan to use them the most on. 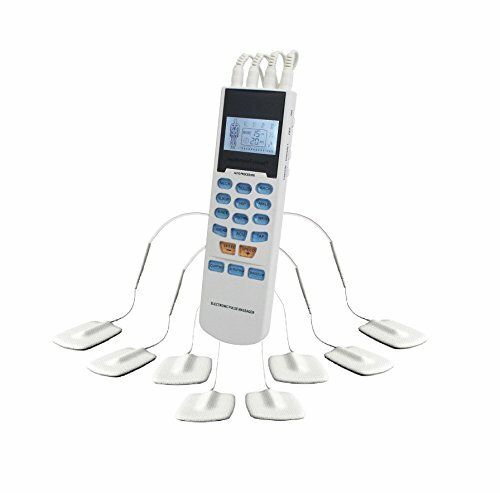 Some of the TENS units come with different modes which mimic different types of massages. For some people, this may not be necessary and may even make the whole process become overly complexed. We have outlined one TENS unit with 24 of these modes. Does this seem like overkill to you? You will need to decide whether these modes are of benefit to you or not. If you don’t need them then you can buy a simple TENS unit. The number of intensity levels is likely to be the more important factor. Ideally, you want a TENS unit with many levels so you can find the right intensity of electrical current you need to relieve your pain. In this section, we’ll look at the best TENS units that are available for home use. These top 5 were chosen as they represent a good spread of functionality. Everyone has different preferences so make sure you know what your’s are, and that you select the right TENS unit to meet those needs. You should find what you are looking for amongst these shortlisted TENS units (listed in no particular order). The TechCare massager is easily one of the best TENS units available for home use. Not only that, but it comes at a very affordable price. 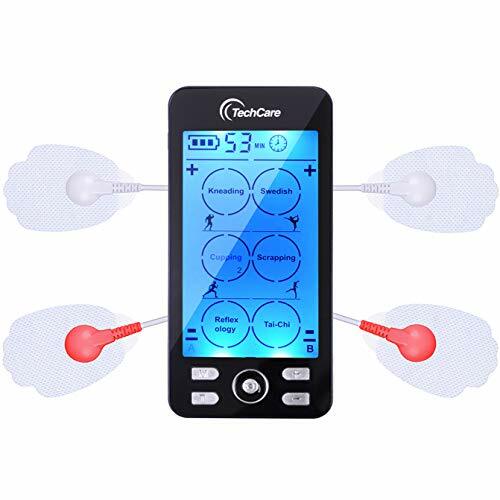 There are plenty of standout features of the TechCare Massager, however, it’s most prominent feature is it’s 24 pre-programmed modes (which is significantly higher than most other competitors). Each massage mode mimics different massage techniques you may get from a massage therapist such as tapping, acupuncture, deep tissue, cupping etc. Each mode is truly unique with different benefits and you’ll be sure to find the relief you are looking for by selecting the mode that most applies to you. The TechCare massager also comes with a large backlit screen making it easily viewable. In addition, the battery boasts a 20-hour battery life and you’ll be saving your money on batteries given that it is chargeable via USB. The HealthmateForever TENS unit is one of the cheapest units on this list yet goes much further than most as it’s both a TENS and EMS unit. It has proven to be one of the more popular TENS unit due to its low price and high functionality. It has 15 modes which include 9 for different body parts and 5 massage modes (knead, acupuncture, tapping, cupping, scraping) and one random mode. If you want bang for your buck then the HealthmateForever TENS unit is a viable option for you. Keep in mind that the quality of build may be lower than some of the other units on this list. Furthermore, if portability is important to you, then you may want to look at a different model as this one is a lot larger than the others. The Max Power Relief is Omron’s latest TENS unit, which offers 6 pre-set pain modes, 3 massage modes each with 15 different power levels. 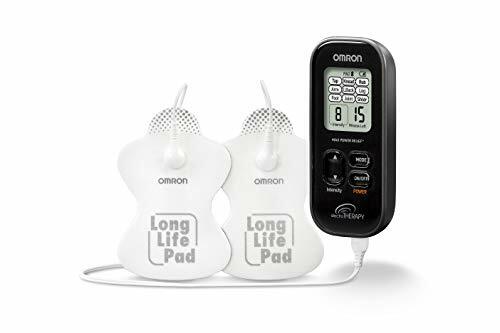 Omron has described this as their most powerful TENS unit to date which will attract many buyers looking for a powerful yet compact unit. This model is easy to use and simple to control with only 3 buttons on the unit. One potential drawback is that it requires 2 AA batteries unlike the TechCare Plus Massager which is fully rechargeable. In addition, the screen on the Max Power Relief unit is not backlit like the TechCare Plus. It is, however, more powerful than the TechCare Plus. The PlayMakar gives us a glimpse of the direction that all TENS units will evolve to eventually with its adoption of wireless technology. The connection from the unit to the pad is totally wire free. That’s right, with the PlayMakar there are no wires running from the unit to the pads making this the ultimate TENS unit for users who want to use their unit discretely and not have the mess of countless wires running all over the place. 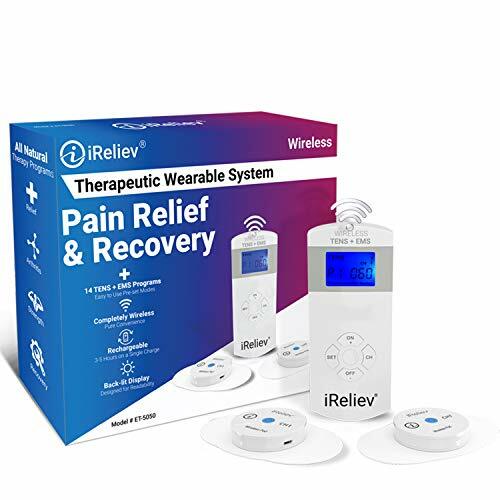 The other huge benefit of this model is that it is not only a TENS unit, but also offers EMS functionality to help relieve muscular pain in addition to the types of pain a TENS unit typically targets. There are seven TENS programs plus an additional one for arthritis, six EMS programs making a total of fourteen in all. The PlayMakar is a groundbreaking device offering additional functionalities that the other models can only dream of. However, like all things, with new technology and additional features, this TENS unit becomes a lot more costly than the other units. If you’re looking for a powerful device to help relieve your body pains then the TENS 7000 is the best unit for you. The TENS 7000 is one of the most popular and highly regarded TENS unit on the market due to its effectiveness and ease of use. The TENS 7000 comes with five different modes (Burst, Normal, Modulation, Strength-Duration Mode 1 & 2) and the two knobs at the top of the unit can be used to control the pulse amplitude or intensity levels. 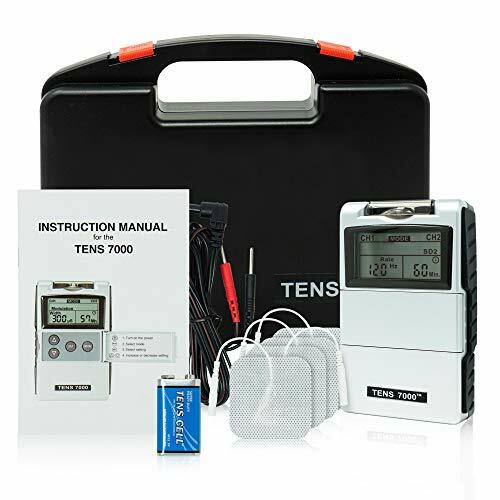 In addition, the TENS 7000 can be used to treat two parts of the body at the same time given that it is dual channel. Whilst it’s simplicity may be a big plus to some, others may be more attracted to other TENS unit models which have large backlit touch screens and don’t look like they are from the 1980s. Furthermore, it doesn’t have some of the extra bells and whistles like some of the other models do such as numerous massage modes and USB charging. The above list should help point you in the right direction to finding the right TENS unit for you. If you’ve never used a TENS unit or are still unsure about the whole idea, then it would be a good idea to seek professional help beforehand particularly those who have a pacemaker or some other type of metal implant. People with heart problems or a history of epilepsy should also seek medical advice before using a TENS unit. A health professional such as a physiotherapist will be able to give you advice on whether you need one or even let you use their own one. On the other hand, it is easy to get started and to purchase one for yourself using our short guide. If you do buy one, be sure to read the instructions carefully so that you can learn to adjust the settings to meet your needs.